The European Union (EU) will have to understand Serbia’s relations with Russia, if it wishes to see it as its future member, Serbian President Aleksandar Vucic said after meeting visiting Russian Foreign Minister Sergey Lavrov on Thursday in Belgrade. 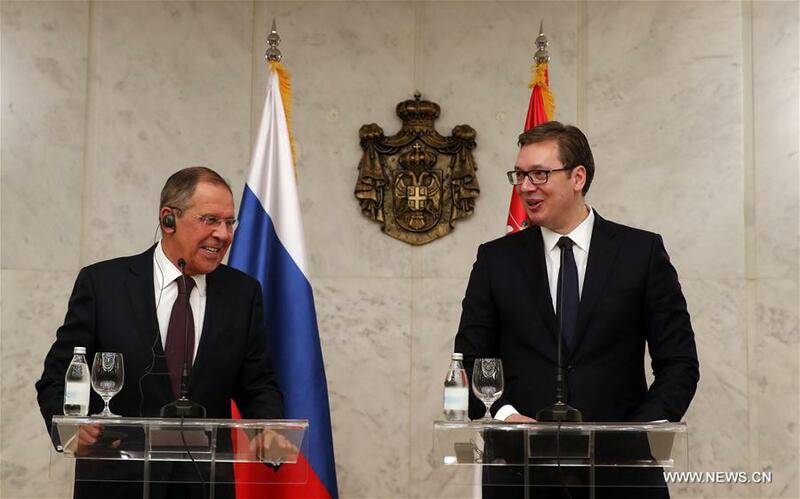 Lavrov landed at the Belgrade Airport on Wednesday afternoon to attend the ceremony of the 180th anniversary of diplomatic relations between the two countries. He was greeted by his Serbian counterpart Ivica Dacic, and immediately afterwards went to Villa Mir in Belgrade, where he met President Vucic and held a joint press conference. Vucic said at the conference that the EU demand that Serbia harmonizes its foreign policy before becoming a member country – presents “an obstacle” and that it will take good will of the EU to overcome it. “In the (recently adopted) strategy for the Western Balkans for the first time it is said that we should achieve full harmonization of our foreign policy with the EU, before becoming a full member of the EU… We have a major obstacle that we have to overcome, and not only Serbian or Russian good will is required in order for it to be solved, but also the good will of Kosovo Albanians, European Council and the European Union,” he said, referring to Serbia’s southern province that unilaterally seceded in 2008. Vucic stressed that Serbia will resist all pressures to impose sanctions upon Russia, and will always respect the traditional relations with Russia and develop them further in the best possible way, acting as an independent country that brings its own decisions, and “not changing the direction and nature of relations in the future”. “Serbia will continue to respect its own policy, and we hope that the EU will be able to understand the specific nature of our relations with Russia. I believe in that, but if that is not the case – Serbia is an independent and free country,” Vucic highlighted, revealing that the country relies on its strategic cooperation with Russia when it comes to the accelerated modernization of its army, as well as when it comes to the natural gas supply. Lavrov accused the EU of pressuring candidate countries to opt against Russia, and appealed that “the countries of the region should not be put under false choice – West or Russia”, mentioning Ukrainian crisis as the negative result of such conditioning. He said that the EU conditions Serbian progress in the European integrations both by asking from it to impose sanctions against Russia and to recognize the independence of Kosovo, while the Russian relations with Serbia are not based on conditioning, as “Russia welcomes both Serbia’s aspirations towards the EU and the Eurasian Economic Union”, as well as Serbia’s military neutrality. When it comes to Kosovo, Lavrov said that the EU has to make additional steps to justify the thrust given by the international community in solving this issue, and said that Russia is ready to get involved in negotiations on the request of Serbian side, if Pristina asks for the assistance of the United States. “Currently the dialogue established between Belgrade and Pristina which resulted in some agreements, cannot deliver the implementation of these agreements,” Lavrov warned, mentioning the inability to form the Association of Serbian municipalities in Kosovo envisaged by the Brussels agreement, establish the Specialist Chambers for the prosecution of war crimes in Kosovo, or oppose to announcements of authorities in Pristina about formation of so called “army of Kosovo”.